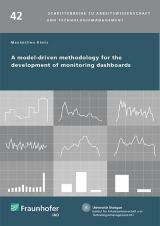 The present work introduces a new model-driven methodology for the development of monitoring dashboards. The methodology uses a process and goal model and a views model, allowing the generation of user-specific dashboards. The modelled information is converted into dashboard description files using the specifically introduced VisML. These files can be rendered in different ways and easily be edited. An evaluation with a use-case from the claim management process shows that the solution is suitable for production.